Korean restaurants in Japan date back at least a century; many were set up to serve migrants from Japan's new colony during the early 20th Century. However, Japanese did not really eat Korean food in large quantities until the early 1980s or so, around the time it became popular in Japan to patronize ethnic (non-Western and non-Chinese) restaurants. 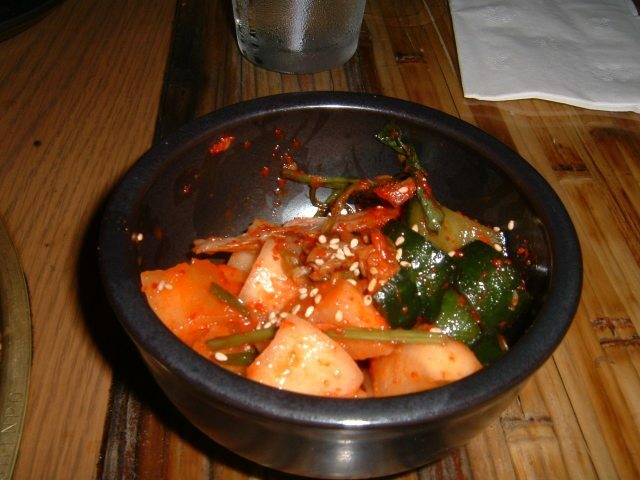 From this period on, however, the popularity of Korean food has expanded at an amazingly rapid pace, and has over the past decade or in particular developed to the point where Korean-style restaurants are a feature of even small communities and kimchi can be found in all of your local convenience stores. How and why did this happen? One clue to this can be found in the fact that the idea a “Korean meal” in Japan is associated almost entirely with eating grilled meat, particularly beef. Indeed, the Japanese word for grilled meat, yakiniku, is used in Japan almost synonymously to refer to Korean fooｄ。 Nearly every large Korean restaurant in Honolulu will display these characters 「焼肉」, 「焼き肉」, 「やきにく」 prominently on their windows, signs, and / or doors in order to attract Japanese tourists. It is of course true that kalbi, bulgogi, etc. are extremely popular as restaurant food in Korea, but they are simply one element of the cuisine, and not dominant by any means as they are in Japan. Indeed, it's plausible to say that the phenomenal popularity of Korean food in Japan is in large part due to the role it has played in helping Japan to adapt its cuisine to the increased availability and consumption of meat, particularly beef. Korea has a long tradition of eating meat. In Japan, however, meat-eating was long a matter for customary and even legal prohibition, and occasional transgressions of such norms had to go other such euphemisms as "mountain whale". While this opposition is often attributed to Buddhist teachings, this would be puzzling in light of the fact that no other Buddhist country (including Korea) applied vegetarian strictures so strictly to commoners. Nor does it explain why the more plentiful fish were allowed. At any rate, starting from the Meiji Era, when the post-Restoration leaders decided that Japan's diet must emulate that of the West and the Meiji emperor famously stated that "those who do not eat meat are not civilized", the amount of meat in the Japanese diet has steadily increased and prohibitions have evaporated. Until fairly recently, however, beef was an expensive commodity, and its consumption was lower than that of pork or chicken. This changed during the 1980s and 90s, when trade barriers against imported beef were gradually loosened in response to outside political pressure. These moves made large quantities of frozen, grillable cuts of beef from Australia, the U.S., and elsewhere available at a relatively reasonable price. However, there was no established culinary context in Japan for the integration of grilled beef into everyday eating. Since the early 20th century, the niche for grilled beef in Japan had been filled primarily by steakhouses and by the "teppanyaki" restaurant concept, in which unmarinated steaks were grilled on a heated steel counter and served with Japanese-style sauces. And while teppanyaki has long been one of the most popular types of "Japanese" restaurants in the U.S. since being introduced here by "Rocky" Aoki through his Benihana chain in 1964. In Japan, however, teppanyaki was originally considered a kind of "Western" food, and has not featured the kind of knife-tossing hysteria introduced into American versions of teppanyaki by Aoki. Moreover, teppanyaki has always been an upscale experience based on luxury ingredients (if you don’t have steak, you might end up with lobster or king prawns) and was still basically Western in its meal construction (besides the large piece of meat, a few sauteed veggies), and thus could hardly be eaten on a regular basis. The phenomenal spread of “Korean” yakiniku in Japan can thus be explained by a combination of characteristics that are complementary to the ongoing trends towards increased meat consumption and experimentation with ethnic foods. First, it provides beef in a culinary context (soy-based marinade, cut during preparation rather than on the plate, numerous side dishes and rice) that are easier to reconcile with typical Japanese preferences and eating habits than Western-style steak or even teppanyaki. 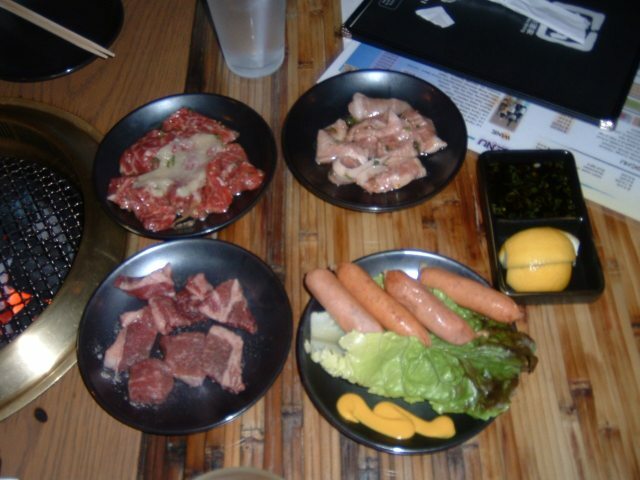 Second, it can be made using varieties and cuts of meat that were not quite as luxurious as those needed for teppanyaki. Thus it can take advantage of imported frozen meat and can be eaten regularly at an affordable price. Finally it draws upon a long tradition of sophisticated beef cookery, and provides an eating experience that is both “ethnic” and familiar. Gyukaku is a manifestation of the burgeoning popularity of Korean food. Boasting 800 branches throughout Japan, it is one of the great success stories of the Japanese mass-feeding industry. It is also a manifestation of the ways in which Korean food has been “domesticated” in Japan, turning it into something that would hardly be recognized as Korean in its home country. The differences between Gyukaku and a typical Korean-Korean bulgogi restaurant are numerous. The most notable thing about the presentation is that everything is ala carte, including rice, side dishes, and kimchi, and you are expected to pay for everything separately. This comes as culture shock to many Koreans who walk into Korean-Japanese restaurants and expect to have an assortment of panchan arrive for no charge as part of their order (this happens a lot in Waikiki). Furthermore, the meat arrives in small portions (two to four portions are needed to feed one adult person, along with side dishes) and you are allowed a choice of marinades for each type of meat. 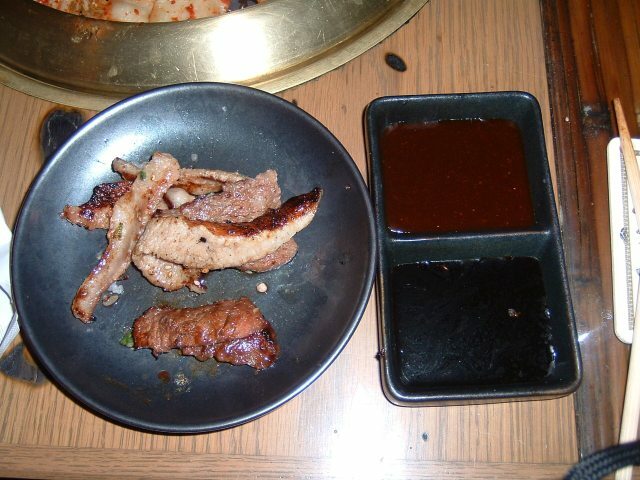 In Korea, meat arrives in portions large enough to feed (at least in theory) one or more people, and the each type of meat has its own distinctive, fixed marinade. For instance, in Korea, pork bulgogi marinade is always prepared with chili bean paste, while beef bulgogi marinade never has any chili. 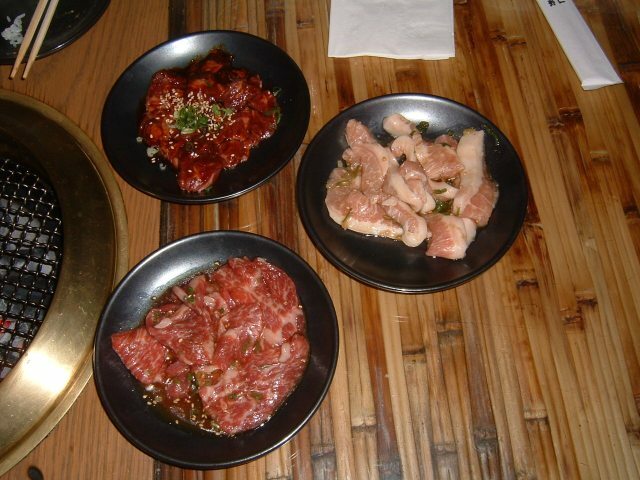 At Gyukaku, there are four basic types of marinade: tare (soy sauce-based), miso, garlic, and salt-based, and for most types of meat you are allowed to mix-and -match the marinade that you prefer from some subset of these. The marinades themselves are different, quite a bit sweeter than any meat marinade you would encounter at a Korean-Korean restaurant. The types and cuts of meat are different as well. 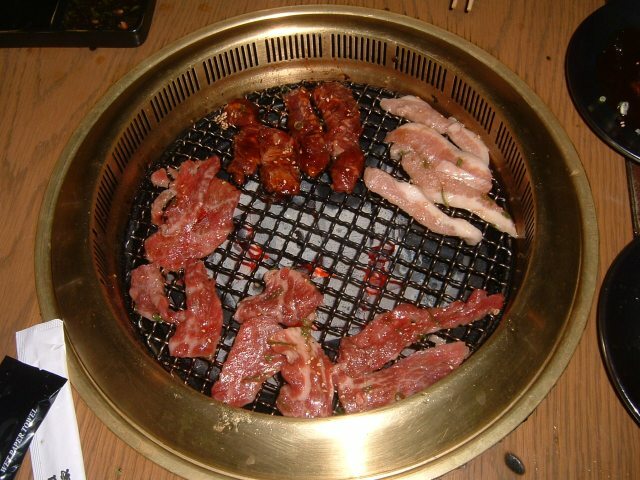 Typical Korean beef cuts such as chadol baegi (side brisket) and jebi churi (chuck) that are one the chewier side do not seem popular in Japan, nor is rolled pork belly (fresh bacon) (samgyeopsal), the basis for the prototypical male-bonding meal in Korea. On the other hand, one cut of beef found in Gyukaku, harami (inside skirt of beef) seems to be distinctively Japanese, as are some of the other grilling alternatives such as kurobuta (Berkshire pork) sausage. This consists of spicy miso-marinated nakaochi kalbi, “p-toro”, and tare-marinated harami. One thing you can always depend on at Korean-Japanese restaurants is that the meat will always be tender, and the nakaochi kalbi is no exception. Now if I can just figure out what it means, lit. the characters are “middle-fall”. According to Japanese dictionaries, nakaochi refers to the middle bone on a fish when it is cut into three pieces, as well as the flesh clinging to it. So nakaochi kalbi must mean something like “center cut”. Not sure if this is really significant for the taste. But at any rate the bone would be larger than normal, if there was any bone, which there isn’t, another dependable feature of Korean-Japanese restaurants, even though kalbi means “rib”. The red miso is very sweet and only slightly hot. P-toro is Gyukaku’s name for pork pieces from where, I’m not sure. “Toro” is the term for tuna belly (another fish analogy!) and “P” apparently stands for “pig”. So cute! However, this doesn’t look like pork bellies – not fatty enough. It comes with plain salt-based marinade. The harami (fajita) is only slightly chewier than the kalbi cuts. Can’t remember what I thought about the marinade. (top-left clockwise) garlic kalbi, more p-toro, kurobuta sausage, rosu. The garlic seems to be placed on top of the kalbi rather than used as a marinade. While there is quite a bit of it, it looks to have been rendered innocuous by some sort of pre-cooking process. This is regular kalbi, not nakaochi. The kurobuta (lit.“black pig”, i.e. Berkshire) sausage looks disturbingly like the stuff that you find in Japanese supermarkets in little tube-like containers. However, it turns out to be a tiny but good-quality cured sausage with noticeable smoke flavor. Even the mustard has a reasonable kick and has a bit of vinegar in it, Western-style. Rosu (lit. “roast”) is little square pieces of unmarinated beef. This perhaps the only area of yakiniku where Japan seems to have actually exported ideas back to Korea, where rosu gui has become a popular grilling option. 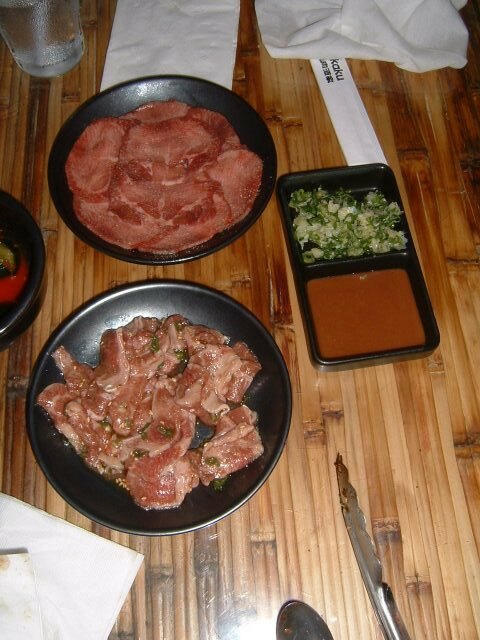 Tongue (gyuutan) is a popular item on the yakiniku grill in both Japan and Korea. No marinade but it’s possible to get it with green onions (negi-tan. We got more kalbi, with the regular soy-based marinade. . .
You cook over live charcoal. The setup here has a round, square-mesh screen covering a relatively small, recessed firebox build into the table. The mesh is small enough so that you don’t have to worry about anything falling into the fire. The vertical slats are apparently some kind of ventilation system built into the grill. The overhead smoke ventilation fans here are very unobstrusive, and very little smoke comes out of this grill anyway. The cooked meat here comes with two kinds of sauces, a ponzu (soy citrus) sauce and a rather sweet sauce bordering on tonkatsu sauce. As mentioned, you have to order the kimchi separately. We finally gave in after getting overloaded on meat and a tiny bit of rice. The scandalous fact that you have to pay for it aside, the kimchi is not as "kimuchi"-ish as you would expect. It is a closer to Korean kimchi than sweet n’ sour the kind you find in Japanese supermarkets and convenience stores. The Kapiolani branch of Gyukaku is on the first floor of an office building on the makai-Ewa side of the corner of Kapiolani and Pi`ikoi that seems to house mostly dentists. There’s a small validated parking lot, or you can try chance the street parking. There’s another branch in Waikiki, three in L.A. and the remaining 800 or in Japan. None in Korea as of yet, though that wouldn’t surprise me – they would just have to bill themselves as a “Japanese restaurant”. 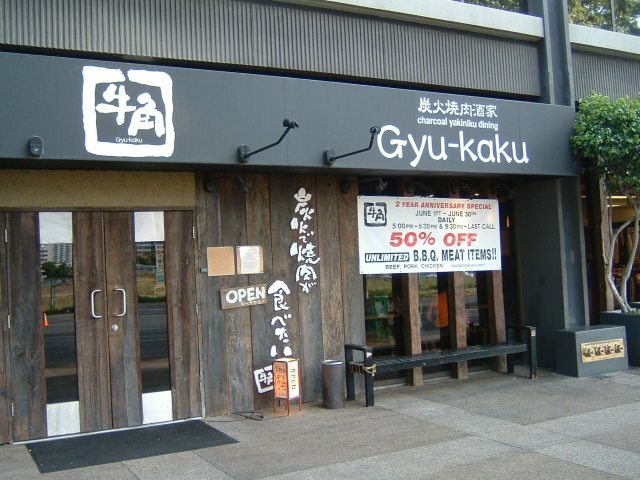 I was at the Gyukaku Kapiolani location this past summer with my Korean food loving friends. I suppose it's a place to take out-of-town guests but afterwards, they did tell me that they stick to the Korean run places for authentic food. Just as you mentioned, what you pay extra for at Gyukaku you get complimentary at any Korean place. I asked a butcher friend of mine who worked in Tokyo about the nakaochi and he said that it is also known as "geta kalbi". It is cut from short ribs into "fingers" and then those strips are halved lengthwise to a uniform thickness and sold as nakaochi kalbi pieces. I noticed the skirt steak at Gyukaku and was wondering the availablilty of hanger steak in Hawaii. This cut of meat is of great interest here in the Vancouver eGullet forum as of late due in part to Anthony Bourdain's recent visit to our city. His new cookbook "Les Halles" mentions the hanger or "onglet" in a few recipes. I look forward to visiting your Honolulu recommendations when I visit for 2 weeks at Christmas time. Also, if anyone could recommend any wine bars in Honolulu, I would very much appreciate it! I can't believe your pictures weren't taken in Japan!! Everything down to the dishes and the outside of the restaurant look exactly the same. Thanks, Kristin. Come to think of it, the sauces may have been associated with one of the cuts of meat that we ordered. Just can't remember which one it was! montrachet, thanks so much for the clarification on the nakaochi. It sounds very much like the ordinary way in which ribs are prepared for kalbi in Korea, though in Korea they are butterflied and left attached to the bone as a kind of "flag". Wonder how the regular kalbi at Gyukaku is cut. . .
Have not seen hanger steak for sale here in Hawai`i but have not looked for it either. One of our posters is one of the state's preeminent meat purveyors - any comments Lym? Finally, regarding wine bars, here's a short article from the Advertiser a few months ago. Here is a recent review for Little Vino. Thanks so much for the link to wine bars in Honolulu. I never knew about the 'Ilima awards either so now I have a lot of places to go when I am there. The beef being utilized in the photos appears to be the "Skirt Steak" or "Diaphragm" from the Forequarter. This is what is used at all the, "Gyukaku Restaurants" in Japan as well as for, "Fajita" in many Mexican Dishes. In "Honolulu" the Hanger Steak's from all the Island Slaughter Houses such as Hawaii Meats was traditionally pre-ordered by Chinese Jobbers who supplied the majority of Chop Suey Restaurants with this cut for their Beef Dishes, especially the Island Favorites of Beef Tomato and Beef Chow Fun with Peppers. The, "Islands" best , "Pippikalua" was also made from Hanger Steak when available. When I wanted to order this cut for personal use or customers request I would need to arrange this in advance and for only a limited number of pieces. It started to become more available when the New Zealand/Australian Frozen Boxed Flank Steaks were imported at a lower price and constant availability for the expanding market. Is there still availability of local Beef in the Island's ? I always felt that the , "Onglet Steaks" I often prepared at, "Lisboa", for various European Chef's who were employed in Honolulu Restaurant's that I arranged from Beef provided by the, "Robinson Ranch" that we aged was the best I have ever eaten anywhere, and I learned about using the cut in French, Italian and Spanish Restaurant's. Any visitor should try and enjoy the taste of the Local Pork from the Islands as its generally smaller, leaner with better taste and character then the mainland pork. Thank you Irwin for the information. I will look forward to having more pork dishes while I am in Hawaii. When in Japan, I prefer having the Kurobuta (AKA Berkshire pork, right skchai?) rather than the well-marbled and ultra tender beef that they are known for. I like tastier cuts that release flavor during the "chew". I am intrigued by your mention of "Pippikalua" and will try that as well if I can find some. Irwin, as usual you have saved us all. Never knew that stuff like pipi kaula and beef chow fun were made from hanger steak - little did we know we were consuming such a fashionable cut of beef! Interestingly enough, the recipes I have seen for pipi kaula (Hawaiian-style cured and dried beef) call for flank steak. Local beef is definitely still available here in the islands, including "luxury" beef previously shipped in from the mainland. Big Island beef is increasingly being supplemented by beef from grass-fed cattle raised on former pineapple and cane lands on other islands, including on Oahu by the North Shore Cattle Company. I totally agree with you about local pork. . .
Montrachet, it's interesting you mention your preference for kurobuta/Berkshire. Someone could write a book (or at least a Saveur article) about the history of this breed. Allegedly developed originally (according to dubious legend) by Oliver Cromwell between bouts with the royals, it was introduced into Japan from its native Britain over a century ago. In the last few generations, however, Berkshire had nearly disappeared from British and other Western markets and restaurants due to its expense (it tends to put on weight slowly) as well as (strangely enough) its relatively dark flesh, which many marketers felt turned off consumers looking for "the other white meat". However, it has remained a prized breed in Japan of all places, where production and consumption never dropped off, due to its unsurpassed flavor and marbling. Hence, almost all the Berkshire pork that was produced in the West was exported to Japan. Recently, with increasing demand for luxury meats, it is coming back into favor in the lands of its origin, particularly in high-end restaurants. Kristin, thanks for the link to the liver sashimi thread. . .
thanks for the realllllly nice article!